I'm a little late to the chambray shirtdress party. Last spring, it seemed like every sewing blogger on the planet sewed a chambray shirtdress at some point. 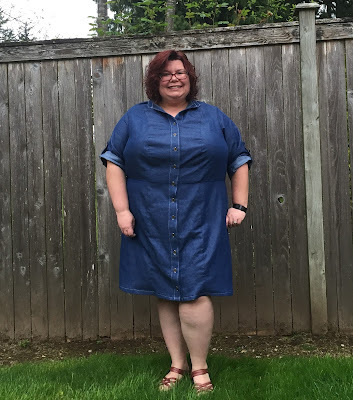 I had every intention of doing so at that time, but it seemed like most of the chambrays that I'd felt either didn't feel beefy enough for a dress or were a little stiff, and I was worried about the lack of drape in a dress. A few weeks ago, Fabric Mart posted a lovely indigo blue chambray, and I snapped up the chance to obtain a few yards, thinking that I might have finally found my perfect chambray. As of this posting, they're nearly sold out, but knowing Fabric Mart, they'll get something similar in. 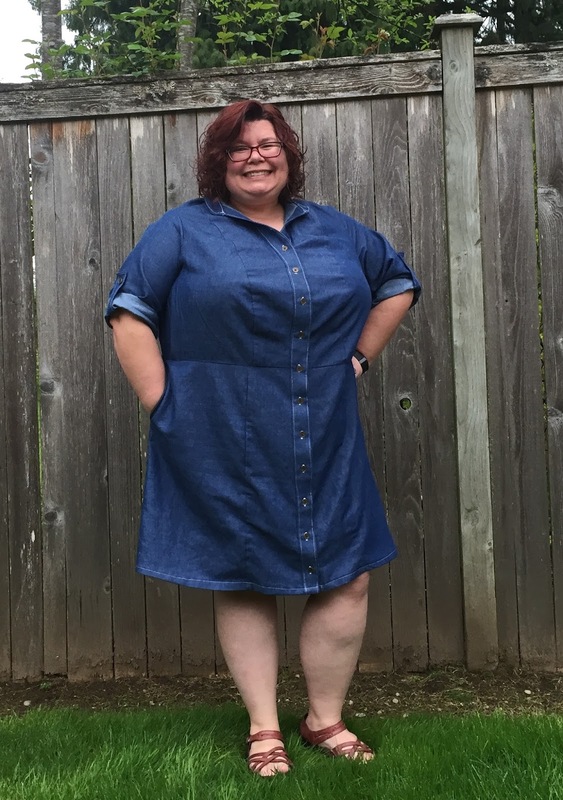 I feel like I lucked out this time around; it's the perfect weight and hand for a shirtdress--a substantial enough weight for a dress without feeling like blue jean denim. 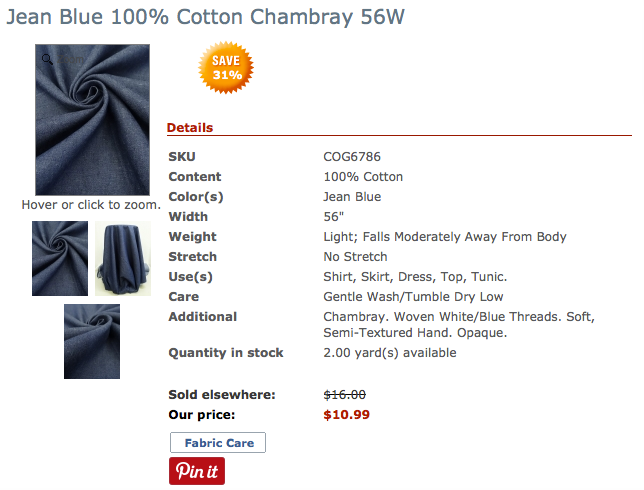 Now that I finally had my perfect chambray fabric, I had to select a pattern. 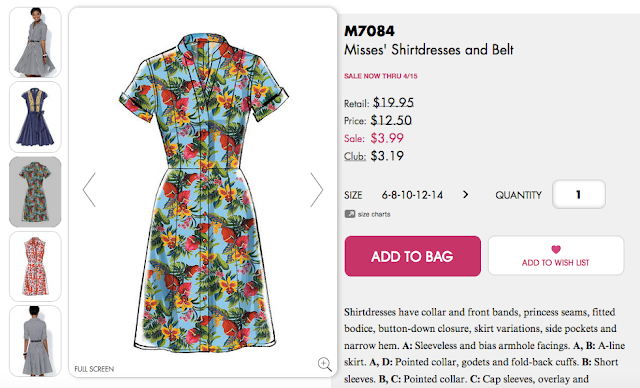 I hoard shirtdress patterns like they're in danger of disappearing from the face of the earth, so I had quite a few in my stash to select from. 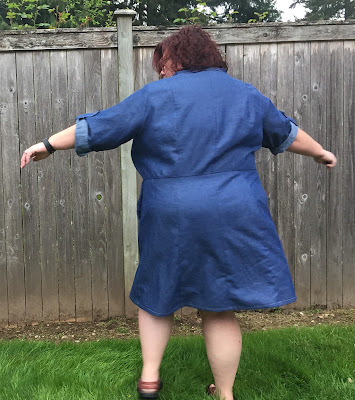 Given that my fabric wasn't super drapey, I wanted to avoid gathers or shirring (several of my shirtdress patterns have shirring at the shoulders to add shaping and design details). I also prefer a skirt that's at least A-line in fullness over a straight or pencil skirt. I ended up choosing McCall's 7084, which was released about a year and a half ago and has been sitting in my pattern stash for nearly as long. I chose this pattern for the shoulder princess seams (easier to adjust for a very large bust) and gored A-line skirt (easier to fit when you have a tummy and a large bum). M7084 also has several sleeve options and the option of either a traditional or band collar. I prefer to keep my necklines as open as possible, so I went with the band collar. I also chose the rolled-up, tabbed sleeves just because I liked the style/detail. Overall, the pattern fits as expected. 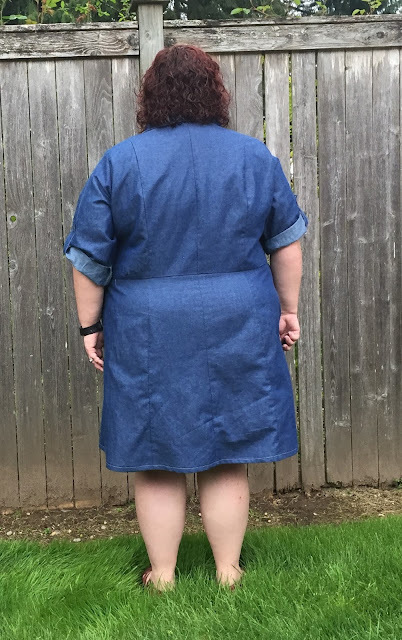 I started with my usual Big 4 size 22 and altered from there. I made my typical Big 4 adjustments: Full Bust Adjustment (FBA), lowering the bust point, full arm adjustment, and a broad back adjustment. I went with the shorter view of the skirt (I'm 5'2"), and the skirt hits just below my knee--my favorite skirt length. Just to add a bit more detail to a solid blue dress, I used white contrast top-stitching on the collar, sleeve tabs, button placket, button holes, and hem. Amazingly, I did not need to do a "large booty adjustment" (for my ample behind) on the back of the skirt, and it still hangs level. Overall, I think that this is a great basic dress for spring. The fabric is a nice weight, and given that I used sleeves, I'll be able to wear it to work without freezing under my office's air conditioning. The neutral dress color also means that I can throw any color jacket or cardigan over the dress on days where I need to layer. And now that I've made all of the fitting alterations for this pattern, I am looking forward to making quite a few more shirtdresses while the weather is warm! Great review and great dress. Fit looks fab. Love this dress & the fit is perfect! This looks like a classic that you'll get lots of wear from, either layered or by itself. I love it--looks great on you too! Really great review. You did a really professional job on your dress, which looks great on you! Wonderful dress! Looks very nice on you! You made a lovely dress that fits very well ! I am planning my shirtdress make so I enjoyed your post. ACK!!! I love this dress! It looks great on you. This is next up on my sewing list. Wow, looks great. Nice job!